It was so fun to live blog this event, something I rarely get to do now. I just love in taking all this information from the world’s largest brands, this is a raw capture. 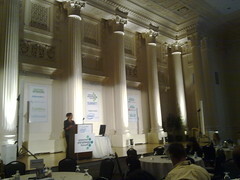 Read the live tweets #ISF09 here at the Internet Strategy Forum in Portland. Katherine Durham VP of Marketing, who I just met this morning is responsible for many of the consumer facing product lines at HP, Imaging and Printing Group, view her LinkedIn profile to learn more. The more things change the more they stay the same, reaching the right customer with the right message at the right time, and in the right place. Digital is getting marketing what it used to be. Talks about the old corner store, how relationships were built in real life, digital is doing the same now. 14hours per week are spent online by consumers (40% of time) however companies only spend 5% online. Social media isn’t just for kids, many are not accessing it from twitter.com but are using mobile devices. Talks about forkfly.com a mobile social network that enables customers to show restaurants coupons while at the table. The importance of reviews are important as they give credibility. 87% of customers would rather ask a friend and trust them than see a critics view about that product. Gives a customer reference to BazaarVoice, who helps increase results. 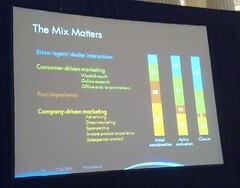 The mix still matters, traditional marketing tools still matter. She breaks it down in three different stages: initial consideration, active evaluation, closure, and shows the mix changing. See below image. Breaks down in three cross channel shopping opportunities from online, in-store, and on-ad. Social networking has become important within the employee culture. Mom is a key target for them, talks about the Pioneerwoman blog –as great example of a blog that demonstrages a customer using printing products in her life. http://thepioneerwoman.com/ Gave a case study how the blogger Ree drove more conversion. They have a social media lead that builds relationships with key influencers and bloggers, they gave products to the top bloggers to give to their community –making the blogger appear like a community hero. HP just recently launched a Facebook page –a bit late in the game considering how large the company is. She gives the final points that it’s an “AND” not an “OR” use these mediums together with digital and social. Use the data and trust nyour cut, and leave room for innovation and experimentation. Kathy’s got it right, social marketing, while a different approach to marketing that doesn’t work with traidtional marketing efforts, should not be encapsulated as a silo –it needs to be integrated like an overlay across nearly all marketing efforts. Tip: Rather than talk about social in your marketing strategy plans, instead talk about customers –which will naturally lead you to involve their voices in the program. Yesterday’s theme was to take risks and engage in innovation –even in times of economic hardship. Armed and excited with examples from the speakers and panels, the conference was now focused on the ‘how to’, with a focus on engaging your customers to be involved, guide, and lead your company in tandem with your own leadership. First we heard from Forrester’s Peter Burris, who focused on the theme o engaging your innovative customer, he suggested that as you take risks, let your innovative customers be your guide. The conference focus met the needs of multiple industries, and Peter gave data and insight not just how B2C can win but how B2B customers’ reliance on each other –and social tools – changes the marketing game. He referenced IBM’s Sandy Carter’s programs as best in class for bringing community into the forefront of B2B marketing including how they’ve integrated community into next week’s IMPACT event. Peter brings forth a framework to help marketers plan for innovation: PLOT a path forward, which includes: Persona, Develop customer needs through social interactions, Location: Allow customers to create groups, and gives the example that Adobe hosts 700 user groups. Serena software embeds customers in its development & launch processes. Then Option and finally, Test. Position marketing as a resource that B2B customers can use to drive better business outcomes. Blend social media with traditional tactics to create new marketing forms –and new levels of productivity. Ending notes: Innovative customers are ready, willing, and –thanks to social media—able to guide your efforts to manage risk. Next, we heard from Craig Dewar of Microsoft, hailing from New Zealand, he discussed how Microsoft has engaged. His first example, Craig gives the example how Microsoft launched a gaming console into a saturated market where Sony was a leader, and they launched the Xbox product. Each Xbox user can establish their own online identity and can interact with others. As each new game came out a new forum and dialog was formed. The second example is Channel 9 an online community for developers. The third example is Microsoft Dynamics Community, a CRM tool. The goals are: learning, networking, support, and feedback. Even if you build it, they may not come. Critical Mass in a community is hard and will take longer than you think. You won’t get community right, so be prepared to optimize. Long time friend David Berkowitz covered the many sessions, and even was adding pictures in near real time in his live blogging. Pretty dang impressive, even if I may say so myself. See all his posts that are tagged “conferences” to get more detailed coverage of the event. You can also see the hundreds of tweets tagged FMF09, and if you live blogged any of the sessions, leave a comment below. I enjoyed this year’s show, it’s amazing that we had around 500 attendees registered even during a tight economy, it goes to show that now is the time for marketing to step up and innovate. I enjoyed having dinner with clients and drinking a bit too much EJ Gallow wine, heh. I was told that we had a wait list of over 30 vendors that wanted to be in the showcase, it was currently filled to capacity, so the demand for partners who wanted to help brands is clear. It was universally said that Forrester’s Shar stole the show, even with her opening musical rendition (see video from day 1, about 9 minutes in). 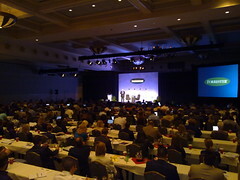 I quick Forrester factoid, Forrester keynotes are encouraged to rehearse 20 times, many times in front of colleagues. We’ve already several more forums lined up, including the Marketing Consumer Forum in Oct in Chicago, see you there. Here’s the archive of the live ustream of Day 2 opening keynotes. Lastly, for attendees, you can login to the Forrester site using your password sent to your before the event to access the presentations. Forrester’s Christine Spivey Overby kicked off the conference, first reminiscing on how great innovation comes out of times of economic struggle. Her example, which is so suited for Forrester’s marketing conference in Orlando, is Walt Disney’s creative genius to develop an iconic entertainment franchise. She stresses that now is the time to do marketing differently by thinking differently and embracing innovation. VP/Principal Analyst on the Interactive Marketing team, Shar VanBoskirk spoke next. She indicates that a recent forecast shows that mobile, social, email, display, and search marketing will increase at a CGR of 17% in 2014. She gives some funny examples of some silly Twitter examples from overzealous customers. Risks: we take them because of the thrill, or the innovation. Enhance: Replace incumbent channel with an unproven one. Shar notes that BestBuy’s remix is a great example of innovating during a recession. They’ve provided an API for third party developers – I’ve outlined the program – the most unique is GPS discovery tool and Camel. With all innovation comes risk, in Best Buy’s case the risk is letting anyone use brand assets. Next, we had Rita Bargerhuff, the VP of Marketing, discussing how 7-11 takes risks. She outlines there are four requirements before diving into risk: 1) is it right for your Brand 2) is it right for consumers 3) is it right for internal stakeholders and 4) Is it right for the environment. Rita eloquently gave a case study of how they aligned the 7-11 brand with the popular Simpsons movie, which while was risky as the show paints “Kwik-e-mart” in a culturally sensitive parody, see a public flickr set. Taking the risk required intensive stakeholder buy-in, which resulted in movie tie-ins, movie product tie-in (squishee), and even creating a Kwik-e-mart store. Did it pay off? Yes, there were lines wrapped around the store to get into the store. Her closing remarks? “Success leads to success You’ll attract new business partners” well spoken. This was cross posted on the Forrester Interactive Marketing Blog, Zach Hofer-Shall gave a quick read over this post before I posted, thanks. Above: Here’s a ustream recording of the opening keynote. 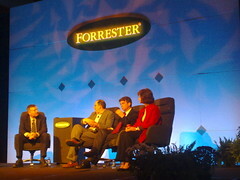 Left: The Future of Media Panel rounds off Day 1 at Forrester’s Marketing Conference. I’m sitting in the front row here in Orlando at Forrester’s Marketing Conference. We’re talking about the “M”M world, no not the Mouse but Media. This closing panel is discussing the Future of Media. Moderator is colleague David Card, Annis Lyles, VP Media of Coca Cola, Greg Clayman, EVP of MTV, and David Verklin CEO of Canoe Ventures. David’s not taking any prisoners and is intending to make this a pretty tough panel, rightfully so, media is undergoing some serious changes. David starts out showing that newspapers is struggling, from NYT, Rocky Mountain, and SFgate. First let’s start with the client side. Coke recalls the day when there were only three major media networks –now there are many. She focuses her strategy on consumers, and first starts with her kids. David, from Canoe has a focus on TV, and says “TV is getting back in the game”. How? to bring interactivity to the TV. He’s extremely optimistic saying that “TV is a platform”, and says he’s going to launch a new product in three weeks. I’m a bit hesitant to his optimism, but hey, I’m open to a briefing. Annis from Coke brings us back to reality, but suggesting we should first collect information from our consumers. David suggests that we can use data to only show TV ads about dog supplies to dog owners. The panel debated over how to get this data, from a variety of sources, such as panels, existing data sources. I certainly hope they read my upcoming report on the Future of the Social Web, some of the answers are in there. David suggests that “the Internet has really raised our game”, and nods to how the benefits of search, and it’s ability to measure. Yet, he suggests that the accuracy and relevancy of internet ads are very low. Moderator David Card fires a blow to the panel and says “What happens when consumers skip through advertisements on TV” The panels spins, rebalanced and comes back. David says that we’ve had ad skipping technology for years, called the “clicker”, nice counter. I didn’t hear any epiphanies out of the panel, not sure if they have a strong idea of the future of media, but hey, this is a very difficult topic. A question from audience: “Why is new interactive ads on TV relevant? It’s still push, interruptive advertising” David suggests that interactive TV will provide new engagements for segments. Cooking shows are entertainment, and chefs are taking notes, instead, they’ll need new experiences to get recipes. The final question from the audience? When does TV and Internet combine. Coke says “all media will merge” and says “it’s now”. Good answer. David from Canoe says 2011, “in next five years content will come across 3 screens” nice bold statement. Greg suggests 3-5 years. David Berkowitz, who I’ve known for years, a top marketing blogger and practitioner is live blogging, see what he wrote. David always has to outdo me and has not 1, but 4 pictures. I’m getting more and more client calls asking about Twitter, although I tend to think most of my readers are the super social elite folks you’d find in Friendfeed. Yet, in reality, many agencies, brands, and executives are just hearing about this microblogging services from the recent media buzz. The above video, created by Lee and Sachi LeFever (I hung out with them in SXSW) of CommonCraft is available here on YouTube, or you can use their license and use for internal education. If you’re seeking to find some of my Forrester colleagues, Alexis Karlin in our web marketing team has an ongoing roster of Forrester employees who happen to be on Twitter. If you happen to be a client, Zach Hofer-Shall and me wrote this report on how to use Twitter based on the Groundswell objectives, or you can catch me at these Twitter conferences: the 140 Twitter conference in Mountain View on May 26-27th, or at Twtrcon in SF on May 31st. 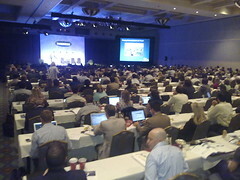 Yes, I find it curious we have Twitter conferences, but people said the same thing about blogging conferences in 2006. If you’re new to Twitter, first read my Twitter FAQ. Then if you want to connect with other folks that are readers of the Web Strategy blog, leave a comment below, then others will follow you in my community, and we can all connect. I’ve noticed that new users have no idea what to do (empty bar syndrome) when they’re not connected with others, I hope this spurs things along for new members. Update: Oh yeah, this is interesting, I helped Tony get on the Tyra Banks TV Show. What’s Wrong With Corporate Social Media? Well, A lot of things. I was invited to join a panel designed by Peter Kim (he used his blog to gather feedback) at the Web 2.0 expo to explore just those topics. We managed to get Charlene Li, and it was like a mini-reunion. Over dinner the preceding night, we decided to focus on four key challenges that we see across the social media marketing industry. 1. How to get culture to adopt & get executives to buy in? 2. How to make social media “campaigns” work? 3. How do you measure social media? 4. Does social media even matter? Audio: Charlene has now posted an MP3 of the session, listen in. For additional information, we made the session interactive and encouraged everyone to write back their thoughts and solutions using the #smfail tag. I’ve looked through the hundreds of tweets, and there weren’t a lot of solutions but mainly retweets and folks tweeting what was said on the panel. It was great to be with my former colleagues, if you get the opportunity to work with them now, I consider you very fortunate.